Illuminating much more than just stores. Lighting at a retail space has always played a crucial role as a key differentiator, creating an enjoyable shopping experience for its customers.The role of lighting today, though, has moved beyond just creating illumination to promoting a brand’s identity at the retail space.With the retail industry thriving in India and the organised retail sector growing at nearly 30 per cent, the importance of breaking away from the clutter is becoming the biggest challenge for any retailer today. Lighting can help defining the identity of retail establishments amid intense market competition in a unique way. As retailers strive to create an experience that meets specific needs – be it the individual signature of a boutique fashion store or the familiarity of a strong supermarket brand – they can increasingly open the door for new and exciting opportunities with light. Lighting plays an important role in influencing consumer behavior and buying preferences. From the freshness of fish to the texture of a leather boot, it can help influence buying decisions. Various studies and researches have shown that getting the customers to try a product increases the chances of conversion into a sale. Hence, the biggest opportunity lies with a retailer when he attracts customers and increases the number of walk-ins that are potential sales leads. Therefore, the retail store should be lit up in a manner that it stands out among the competition and the display of goods catches the attention of the shoppers. Bright and attractive ambient lighting ensures that the customer notices the store and is able to view the complete merchandise and feel compelled to try them too. The lighting design can define a store’s clientele and offering, whether niche or mass. The lighting may vary to compliment the store’s theme and décor and to create a unique atmosphere for its customers. Lighting helps in creating a sharp contrast in order to draw customer’s attention to various special zones in a retail space.With the recent technological developments, there is an array of solutions today, from different shades of white to color changing and ambient lighting.The lighting design support the showroom’s concept and make the showroom look more attractive. Earlier, the retailers endeavor was to just provide proper illumination but today’s trend is to install solutions that not only add value to the showroom’s design and features but also bring down the energy consumption. Sustainable lighting is another differentiator for the retailers today. With the definition of sustainability changing, it is encouraging retailers to consider the environmental impact of their businesses and how they are perceived. Businesses which incorporate sustainable practices are popular with investors, employees and the public. A solid, sustainable reputation increases profitability, by boosting customer retention and appealing to a fresh clientele. Philips is passionate about creating the right ambiance in a retail environment, enabling stores to provide enhanced shopping experiences which are also energy efficient. They have recently launched Philips GreenLED, an energy saving downlighters for retail segment. This is the effective replacement for conventional CFL solutions, resulting in significant power saving and reduced operational costs. McDonald’s is the world’s leading food service retailer with more than 31,000 restaurants in 119 countries serving more than 50 million customers each day. Celebrating over 12 years of leadership in food service retailing in India, McDonald’s now has a network of over 160 restaurants across the country. McDonalds as a company is very sensitive towards its environment responsibility and has always encouraged innovations to reduce their carbon foot prints. To keep up with their environmental responsibilities, McDonald wanted to bring down their energy consumption. 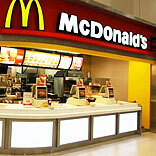 McDonalds reached out to Philips Lighting India for solutions which could help them achieve its goal. Philips got involved with them and installed LED lighting solutions which not only helped them reduce energy consumption but also provided with an added benefit of a near-zero maintenance of the light fixtures. Philips lighting solutions have managed to deliver a consistent light output and stable colour performance which has resulted in delivering a very warm and welcoming experience to its customers while bringing down their energy consumption thereby supporting its cause towards a clean and green environment.